Merridy was an award-winning English Literature student in South Africa and Tasmania, who went on to work in publishing, editing and the arts. She runs a freelance editing and writing business, operating as a digital nomad from wherever she happens to be in Australia. Since 1992 Merridy has helped produce magazines, websites, academic journals, theses, teaching materials, and books. Her writing encompasses articles, reviews, blogging and other online content, as well as poetry and fiction. 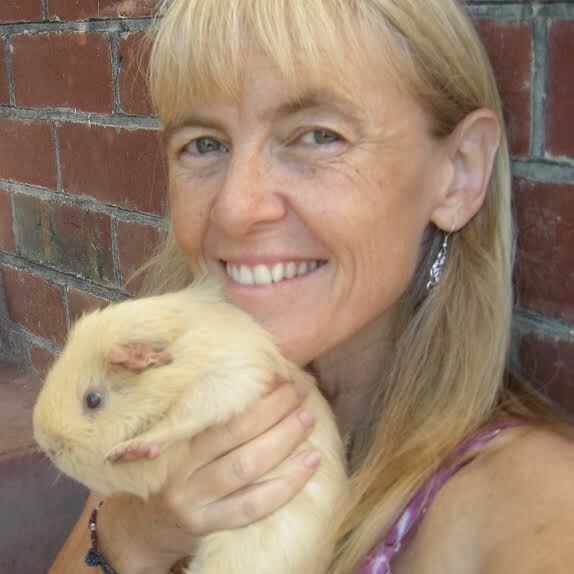 In 2017 Merridy published her first book, Pig Tails: The First-Ever Guinea Pig Novel. She hadn’t exactly pictured herself one day promoting the obscure genre of guinea pig fiction, but this is what happens when you have a large blonde guinea pig as a muse. The muse has ordered a series of children’s picture books along with The Guinea Pig Trilogy (which is for mature readers), so Merridy’s exercising her illustration skills as well as completing Book 2: Boars Behaving Badly. Finally, a guinea pig book for the adult reader. Aids digestion, enhances sleep, promotes interspecies good will. Merridy discovers a surreal guinea pig underworld at the Hobart Guinea Pig Show, where she adopts the tiny pedigree Hazel and the handsome mongrel Chestnut. She has no idea that her home, her family, the island of Tasmania, and ultimately, Planet Earth, will in time be turned upside down by the acquisition of two ridiculous furballs with twiddly little legs. For guinea pigs are smarter than most humans think. And the angelic Hazel is a Pig God in training. Pig Tails is funny, intelligent and deeply humane. You’ll never see a guinea pig the same way again.